June 14th 2004. I bet I know what you’re thinking. “That’s when her hair started falling out” Right? Nope. That’s when I had my ability to walk taken away from me. It was a normal day, and I was training for a big national competition in Australia with my horse. I had been riding for 10 years before that day, and falling off was just another thing. No big deal. I had heard that you had a 2% chance of something going horribly wrong if you fell off a horse, and I’d never come away with anything more then a couple of bruises and some sore muscles until that day. I was now a paraplegic. Being faced with the fact that I would never walk again. Ever. That I would be completely dependant on a wheelchair for the rest of my life and have to learn all over again to do simple tasks like looking after myself. It was hard. Very hard. But not the hardest thing I’ve experienced. Just before my 16th birthday, my hair began to fall out. Very slowly at first, just a few more stands then normal. But in the next week it became more and more noticeable. There would be hair on my pillow, in my sheets, stuck on my clothes, on the lounge, in the shower, absolutely everywhere. Handfuls of hair would painlessly and effortlessly come out just running my fingers through my hair. I used to sit on the bottom of the shower in shock, as I watched my hair run loose with the stream of water and watch the water rise as the hair covered the drain. I was petrified of brushing my hair. I wanted to keep the small amount of hair that I had left. I felt so ugly, so alone, like such a freak. I was a girl! A YOUNG girl. And here I was holding my hair in my hands crying and hoping to God that this was just a horrible, nasty dream. Julie has sent me over her pictures of before and after pictures taken approximately 6 months ago. She was chosen as a model for Reprieve Hair, and these are the pictures from the shoot. 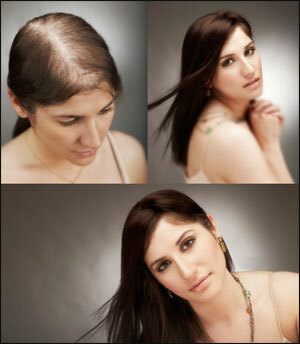 Since her hair loss conditioned has worsened and her hair is very fragile, she can no longer wear it.